The miniDSP SHD Series support a range of network streaming services, including Spotify, Tidal, and Qobuz. Even so, many of us still have a collection of music files that we want to play through an SHD Series processor. In a networked computer music system, a network attached storage (NAS) may be used for music file storage. While there are many manufacturers of NAS units, in this app note we will use a Synology as an example, as they are a popular and widely-available brand. If you use a different brand of NAS, the general techniques in this app note should still work. However, you will need to figure out the specific settings for your brand of NAS. What is a NAS? Essentially, it's a computer that is optimized for storage rather than running desktop apps. Compared to a typical desktop computer, it has a less powerful processor, no graphics capability, and much more storage. The software running on the NAS is typically a customized version of Linux that is optimized for managing hard drives and delivering files over the network. NAS units often have multiple hard drives, 4 being a popular number for home and small office situations, and larger arrays of 8 up to 30 hard drives being used in enterprises. The drives are usually set up in a configuration called "RAID" (redundant array of inexpensive disks) to increase reliability. However, single and dual drive NAS units are also available. Why use a NAS? Reasons vary. Perhaps you need a NAS for other reasons — video, surveillance, or backups, say — so storing your music files there is an obvious thing to do. Or, your music library has outgrown the storage that is in your computer. Or, you want to share the music files with everyone in the house. Or maybe you just want the files to always be available without having to have a computer switched on. Do I have to use a NAS? No, not at all. It's an extra cost and complication, so if you're happy storing your music files on your computer, then that's fine. If you decide to add a NAS at a later time, you can come back to this app note then. We'll assume that you have already set up your NAS and figured out how to load music files onto it. When you set up a Synology, it creates a shared folder named "music" by default, so put some music files in there first. We'll also assume that you're able to log into the web-based user interface, DiskStation Manager (DSM). In the rest of this app note, we'll present three methods of using a NAS with the miniDSP SHD. Pick the one that best fits your situation. In some cases, the size of the library determines which method works best, but this will be system dependent so you may need to experiment for yourself. We recommend picking one of the three methods and not mixing them up together. Note: In our examples, the name of the NAS is "minidsp-NAS" and the username used to access it is "minidsp-user". You will need to substitute the NAS name and username that you used to set up your own NAS. In this method, Volumio is given the location of the NAS and fetches files directly from the NAS. You control playback using the Volumio web interface. → Use this method if you like to use the Volumio web interface and just want a simple way to access music files on the NAS. → Don't use this method if you have a large library. Note that initially the group of settings at the bottom are not shown. You need to click on a button labeled "Show Advanced Settings" so that you can select nfs as the file share type. Leave the Username and Password fields blank. When scanning completes, go to the Browse pane. 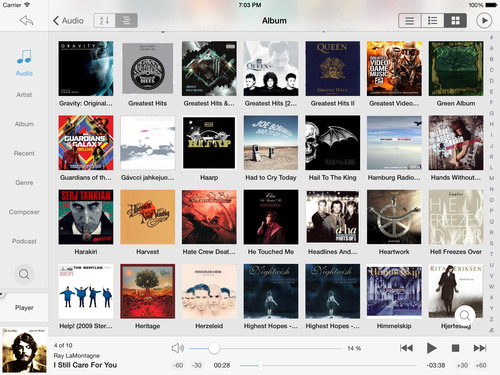 Clicking on the Music Library icon will enable you to browse by folder. However, clicking on Artists, Albums, or Genres will immediately show you the NAS contents in a friendlier style. In this method, you run a music player program on your computer. The music player program fetches audio files from the NAS and sends them to the SHD. You control playback using the user interface of the player program. → Use this method if you want to use a computer-based player like JRiver Media Center or Audirvana Plus. → Don't use this method if you don't want to have a computer turned on every time you play music. Note: While the tutorials linked above use the IP address of the NAS, we found that using the name of the NAS worked fine e.g. "minidsp-nas" or "minidsp-nas.local". Note: If you want to index local files as well as files on the NAS, both of these programs allow you to add additional folders to the library. The music player program will start indexing the music files on the NAS. This may take a while if the library is large. In this method, you install a music server directly onto your NAS. You control playback using a control app running on your computer, phone or tablet. For large libraries, this is generally more efficient than the above two methods, as the music server is running on the same processor that is attached to the hard drives. → Use this method if you have a large or very large library or if you have multiple people that will need to play music. → Don't use this method if you don't want to deal with installing and learning more bits of software. Synology provides a UPnP server named Media Server for its NAS units, which serves music, photos and videos. However, we recommend that you install the third-party MinimServer instead, which is just as easy to install. MinimServer serves music only and is more optimized for that purpose. In our testing, we found that MinimServer scans a large music library much more quickly. Note: if you have a different brand of NAS, you may still be able to install MinimServer. Check the list of supported NAS units on the MinimServer installation page. Open the web-based user interface of your Synology NAS. Open the Package Manager and search for "MinimServer". Click Install. (*) "/volume1/music" is the default folder set up by the Synology NAS for shared music storage. If you have configured your NAS differently, use the path to the folder that you have set up. Lumin app. Runs on iOS and Android. Linn Kazoo. Runs on Mac, Windows, iOS and Android. Note: you will find that you can browse MinimServer from within the Volumio web interface by clicking Browser and then Media Servers. However, this does not work as well as using a control app running on a computer, phone or tablet. To avoid confusion, we suggest that you go to the My Music page in the Volumio web interface and disable the option "DLNA Browser." Click on "Now Playing" in the left sidebar. Click on the library MinimServer[miniDSP-NAS]. Click on the "Load Library" button on the right. There are a number of well-regarded music players that can stream audio to the miniDSP SHD Series over your local area network (LAN). In this app note, we will show you how to use JRiver Media Center (JRMC). JRiver Media Center is available for Mac, Windows and Linux. It is a commercial program with a 30-day free trial. In order to stream audio to the miniDSP SHD, you will need to enable JRMC's Media Network functionality. In the sidebar on the left, click on Services & Plug-ins and then on Media Network. On the right, click on Options. In the next dialog, check "Use Media Network to share this library and enable DLNA." A new dialog box will open. Click Next twice and then OK. Choose "Audiophile 24-bit DAC (PS Audio etc.)" and then click Finish. JRiver Media Center is a popular playback program for Windows and Mac. JRiver recently made a version of Media Center available for the Raspberry Pi, a small embedded computing platform. Combined with a U-DAC8, it makes a very compact and effective networked multichannel (and stereo) audio playback solution! Start up JRiver Media Center (JRMC) on the Raspberry Pi - drop down the Raspberry menu, go to "Sound and Media," and select "JRiver Media Center." In JRMC, drop down the Player menu and select Playback Options. Click on the Audio Device, scroll down and select "surround71:CARD=UDAC8,DEV=0 [ALSA]". Drop down the Player menu and select DSP Studio. For Channels over on the right, drop down the menu and select "5.1 Channels." (If necessary, you can adjust levels and delays on this screen as well.) And that's it! Now set up an audio library. Then you can simply do the same as above for an attached drive, but browse to the location that you mounted the network drive. (Note: if you have difficulty with the network drive not mounting on boot, add the following to the options in fstab (right after "iocharset=utf8"): ,_netdev,x-systemd.automount). This app note is relevant to audio source files (e.g. FLAC format) only. The Raspberry Pi may not have the CPU power to decode video in JRiver Media Center. The Raspberry Pi does not have enough CPU power to transcode multichannel DSD into PCM. So: this setup is only for multichannel PCM audio files (e.g. FLAC). Please note also that miniDSP cannot provide support for third-party hardware or software. While this app note showed you how to set up the miniDSP U-DAC8 with JRiver Media Center running on a Raspberry Pi 3, the features and functions of this hardware and software are beyond the scope of miniDSP support. That's it for this app note! If you want to try some multichannel audio files, you can download samples from 2L of Norway. Have fun, and please let us know about your Raspberry Pi experience in our forum. There are a number of well-regarded music players that can stream audio to the miniDSP SHD Series over your local area network (LAN). In this app note, we will show you how to use Audirvana Plus. Audirvana Plus is available for Mac and Windows. It is a commercial program with a 15-day free trial. The miniDSP U-DAC8 is a compact high-resolution eight-channel DAC with a myriad of uses, from PC-based home theater, multichannel audio, to computer-based active loudspeakers. In this application note we will show you how to use the U-DAC8 with JRiver Media Center to play back multichannel audio on your Mac. Please note: miniDSP cannot provide support for third-party software. This app note shows you how to set up the miniDSP U-DAC8 with JRiver Media Center for multichannel audio playback but any functions of JRiver Media Center are beyond the scope of miniDSP support. We will assume that you already have an JRiver Media Center library set up, which includes multi-channel audio files. These files can be in multichannel (typically 5.1) PCM format up to 192 kHz, or in multichannel DSD format (again typically 5.1). Click on Room Correction to enable it and display the control panel. Select each speaker in turn to configure it (as in steps 3 and 4). For each speaker, set the highpass crossover. For each speaker, set the lowpass routing and slope. You will need to set the items in steps 3 and 4 for your speakers and room. You can also adjust the other parameters on this screen like speaker distance and level. Now you can browse to an album or file in the JRiver Media Center library (screenshot at top of page) and play by clicking on the Play button. You will hear multichannel audio playing through your system. That's it, have fun listening to multichannel audio with your miniDSP U-DAC8 and JRiver Media Center! Let us know how you go on our forum.